Learn how to provide PLC training and professional development for collaborative teacher teams. Study three major variables that will affect instructional coaching—capacity, culture, and context—and four major actions that will act as guiding principles. Explore issues that can arise in PLC schools, as well as teacher coaching strategies to help resolve these issues. Deepen your understanding of instructional coaching in a PLC with helpful online reproducibles and teacher coaching tools. 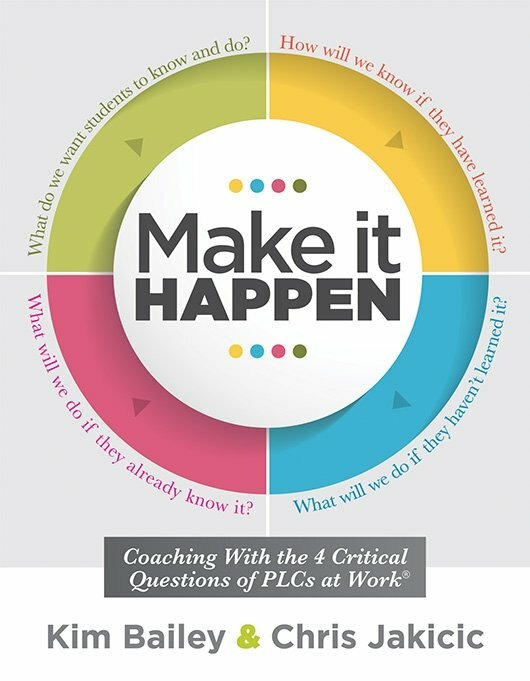 Acquire capacity-building strategies aligned to the four PLC questions. Chapter 2: What Do We Want Students to Know and Be Able to Do? Chapter 3: How Will We Know if They Have Learned It? Chapter 4: How Will We Respond When Some Students Do Not Learn? Chapter 5: How Will We Extend the Learning of Students Who Are Already Proficient? Bailey, K., & Jakicic, C. (2017). Simplifying Common Assessment: A Guide for Professional Learning Communities at Work. Bloomington, IN: Solution Tree Press. Conzemius, A. E., & O’Neill, J. (2014). The Handbook for SMART School Teams (2nd ed.). Bloomington, IN: Solution Tree Press. DuFour, R. (2015). In Praise of American Educators: And How They Can Become Even Better. Bloomington, IN: Solution Tree Press. DuFour, R., DuFour, R., Eaker, R., & Karhanek, G. (2004). Whatever It Takes: How Professional Learning Communities Respond When Kids Don’t Learn. Bloomington, IN: Solution Tree Press. Kanold, T. D. (2011). The Five Disciplines of PLC Leaders. Bloomington, IN: Solution Tree Press. Kanold, T. D. (Ed.). (2013). Common Core Mathematics in a PLC at Work, Grades 6–8. Bloomington, IN: Solution Tree Press. Kanold, T. D., Schuhl, S., Larson, M. R., Barnes, B., Kanold-McIntyre, J., & Toncheff, M. (2018). Mathematics Assessment and Intervention in a PLC at Work. Bloomington, IN: Solution Tree Press. Mattos, M., DuFour, R., DuFour, R., Eaker, R., & Many, T. W. (2016). Concise Answers to Frequently Asked Questions About Professional Learning Communities at Work. Bloomington, IN: Solution Tree Press. Nickelsen, L., & Dickson, M. (2018). Teaching With the Instructional Cha-Chas: Four Steps to Make Learning Stick. Bloomington, IN: Solution Tree Press. Wiliam, D. (2011). Embedded Formative Assessment (2nd ed.). Bloomington, IN: Solution Tree Press.